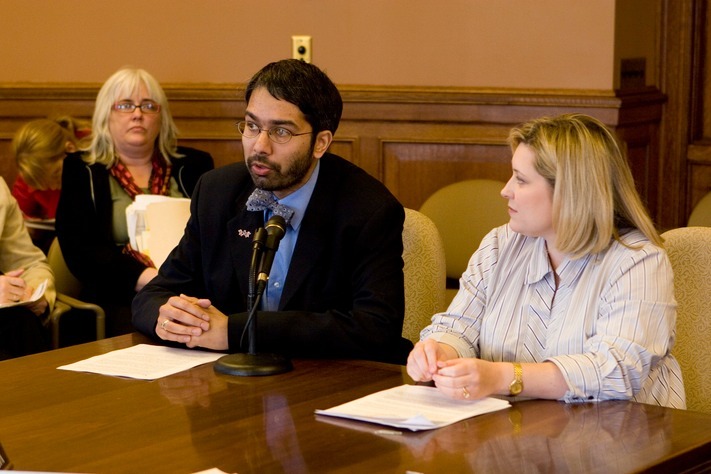 WECA Board Member, Dr. Dipesh Navsaria, testifying in front of a Wisconsin State Senate Committee. The world of Early Brain and Child Development has, for a long time, been a familiar one to those who work in early childhood and in mental health. The terms “toxic stress” and “relational health” may be new to some, but are often twists on concepts, approaches and ideas which have been recognized for a long time. More recently, evolving science has given us biochemical, neurological and genetic markers which illustrate the profound impact that early experiences have on children’s eventual life course. This, in turn, has caught the attention of medical fields, including my own: pediatrics. However, we should not stop there. There are many other arenas who have a strong interest in children and the families they grow up in. Among these are our elected officials and other policymakers, spanning the range from the federal level down to the state, county and local levels. By articulating a clear, consistent process and vision for early childhood, we can collectively ensure that we are positively affecting brain development early on, where the potential for change is greatest. Resolved by the senate, the assembly concurring, That policy decisions enacted by the Wisconsin state legislature will acknowledge and take into account the principles of early childhood brain development and will, whenever possible, consider the concepts of toxic stress, early adversity, and buffering relationships, and note the role of early intervention and investment in early childhood years as important strategies to achieve a lasting foundation for a more prosperous and sustainable state through investing in human capital. This passed the often-deeply-divided Wisconsin legislature — unanimously in both the Senate and the Assembly. While as a Joint Resolution it has limited force of law and no accompanying funding, it is a well-considered start to a longer, larger dialogue. We should not keep early brain and child development a professional secret. While there is much we can do and influence, good public policy and programs will magnify the positive impact by broadening the reach of initiatives which support and nurture the early brain. By breaking down the silos that exist between mental health, primary care, early education and public policy, we can help ensure that the “life course” does not become a “life curse” from the very beginning.